I've decided that I am not a huge fan of writing crap down. I'm doing everything and anything to not do what I'm supposed to do...(in this case, write my comprehensive exam). I ended up fiddling around with the Lab's 3D printer to print a mold, and then ended up on the website/blog. I decided it was time to add another blog post. YES...to avoid writing I decided to write. 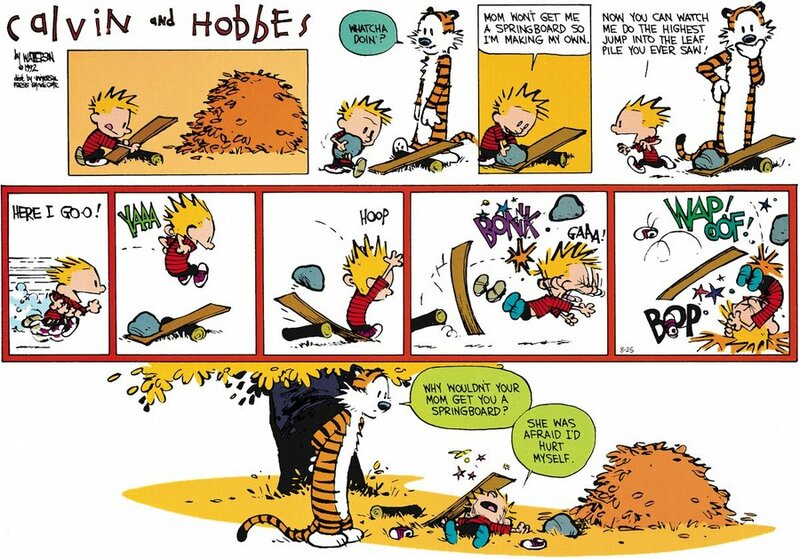 Step 01: Deciding to go for the PhD is analogous to the comic below (Calvin and Hobbes is by far THE best comic strip ever published in a newspaper). On a serious note, I was extremely interested in cardiovascular biomechanics and wanted to learn more. I felt that my undergraduate degree was great, but I wanted to research and learn more. Step 02: I first started graduate school to get a Master's (with thesis). The University of Iowa allows for the thesis defense to double up as a qualifying exam. The only difference is that you need five faculty members for the qualifying exam rather than three (for Master's only). I presented my work in front of five faculty members and qualified to become a PhD Candidate. Step 03: This is where I am at ish. After more research I have to propose a research plan for the dissertation. The comprehensive exam is a proposal for what will happen next...I have an option of writing it as a NIH proposal or a traditional large piece of work. I opted to write the NIH style (12 pages single spaced). However, the bar may be set higher and a lot of the information needs to be 'filled' in during the comprehensive exam hearing. I will also have to stand in front of five faculty members and give a presentation on my proposed dissertation. Step 04: Research more what I said I was going to do from Step 03. Write the dissertation and then finally have my dissertation defense. This is where I ride off into the sunset (hopefully). Anyway, enough procrastination, need to do some real work! This is just a test post. Website is low on the totem-pole when it comes to priorities. Nevertheless, it has been fun piecing it together! Woot woot!